These are some mini bears we had made in 2010 for all of our Canadian friends. 🙂 They are Fenton’s 5251 mold, about 2 3/4 inches tall. Factory painted. Only 29 of these were made. They are light brown with a Canadian Maple Leaf painted on their head. “Exclusively for Collectors’ Showcase” is on the bottom of each one. Really cute! These bears are now available on our web site. We just received the latest Collectors’ Showcase Exclusive from Fenton! 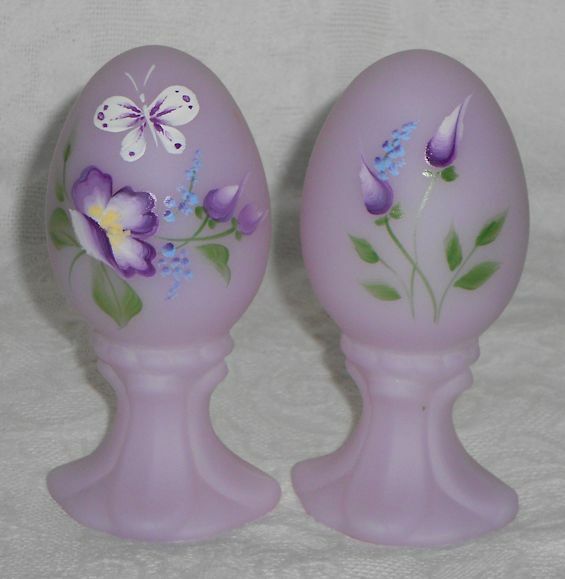 It’s a 4 inch lavender satin egg, hand painted at the factory by JK Spindler with a lovely purple floral and butterfly design. Only 147 of these were made. 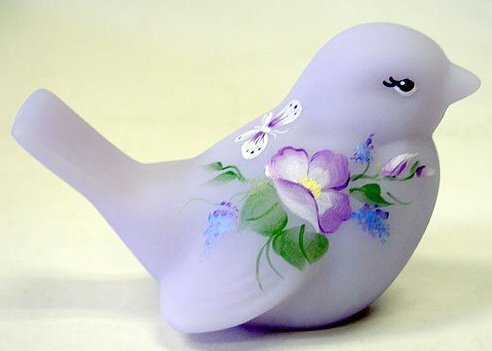 Displays beautifully with this special order bird from 2010. Both pieces are available for sale on our web site. Welcome to 2010!! As promised, we are set to launch our 365 day blog conversation with world famous cameo glass artists, Kelsey Murphy and Robert Bomkamp! Come join us, as together we create a book about The Magic of Cameo Glass! New Cameo Glass Page on Facebook! I made a new page called “Believe in the Magic!” on Facebook, specifically for cameo glass fans! Click on “Become A Fan” to join in and receive updates. To thank all of our wonderful customers this holiday season, we are offering 10% off all online orders through the end of the year! This year, in addition to the many other things I have to be thankful for, I am thankful for all the wonderful friends I have made online. So as a special thank you to all of you, we are offering 10% off for the rest of the holiday season! In addition, we will enter your name in a drawing for a FREE GIFT!! Drawing will be held on New Year’s Day. Thanks again, and I hope you all have a fantastic Thanksgiving week!! We ran across five pieces of Levay from 1980 while looking through storage. Four baskets, and one small vase. The cool thing about these is that they were all made from the same mold, but had different things done to them. I thought they were a nice example of handmade glass, and the unique finishing touches that can change the whole look of a piece. 🙂 Really drives home that they are HAND MADE, individually, and not just churned out by a machine. Mom says she had a whole box of these at one time, but these are all that are left. The vase is signed, “Levay 12/86 1980”. The baskets are not signed. All of these pieces were made from the butterfly and berries tumbler mold, and vary in height and size, from about 4 inches to about 7 1/2 inches. Notice the different crimps used to acheive different looks. Also check out the looped handles on the baskets. Neat! For detailed individual photos, see my album on Facebook, here. Three Dimensional Cameo Glass Elephants! These just came in yesterday. They are not available for sale at this time, but I couldn’t resist sharing pictures with you! They are amazing! These are 3-dimensional, 2 color elephant blanks that Kelsey has had stashed away from before Pilgrim closed. They are 6-7 inches tall, and 10-11 inches long, green over crystal, and sand carved by Kelsey Murphy. Each on is one of a kind, and they both have completely unique personalities. Just too cool! For more pictures, see the albums on my Facebook page, here for “Going Bananas”, and here for “Oasis Watch”. We got a few one of a kind Kelsey Murphy pieces in over the weekend. Mostly sand carved Fenton animals, and one 5 color paperweight blown by Ron Hinkle. All beautiful! Here are a few pictures of the new pieces to whet your appetite. Do you have any pieces that have special meaning to you? Feel free to share below!